A Utahraptor, but I'm told that Dr. Kirkland thinks this one is too skinny. Fair enough, it's now Deinonychus;) Just kidding. Perhaps a delicate female? the colors were chosen as an homage to the book RaptorRed. 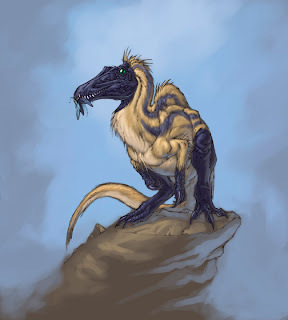 Sinosauropteryx, the first feathered dinosaur discovered. The arms are wrong, but I was going for gopher or weasel and the palms in looked strange. I'm actually not tha tinto the feathers, they look good colored but the drawing of them is rather boring which is why I don't do more of them. Plus I have to be in the right mood to do the thinness of these guys right, I don't know why I just do. Thanks to the first one. For the second, that's a good question. I have no idea since I've never seen anyone draw one. I don't think most people have considered it. Do you need it for something specific? Well i'm writing a book about dinosaurs on Microsoft Word and I've seen many illustrations of early theropods covered in feathers, like Eoraptor and Liliesternus, mostly in Luis V. Rey art. Since the further you go down in history the more similar prosauropods and theropods get. And if "protheropods" were covered in feathers I'd suggest the prosauropods would of had them too. It's entirely possible, it's also possible the feathering goes all the way down to the split between dinosaur and pterosaurs. There are skin impressions of infant titanosaurs that show only scales, so it might be species or group specific. I think most people play it safe and are waiting for some evidence. Well I've heard of Protoavis, a new archosaur?, which lived around 250 million years ago. Some holes on it's armbones suggest it may of had feathers. I'd look into that a bit more, it's most likely a chimera, several animals combined into one. The 'holes' are what they called knobs, as in quill knobs, but they might just be an artifact of preservation, the bones are pretty smashed up. 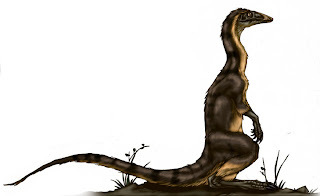 If it is truely one animal than it might be an early bird OR a bird like ceratosaur that went nowhere evolution wise. The fact that the next bird is 75 million years after this is bothersome to say the least. Not to say it's can't happen but it seems like a long shot. You see, I have a hypothesis, that the "quill knobs" are just collagen fibres like in some reptiles. Yet if ceratosaurs (based on no evidence, however) like Limusaurus and Masiakasaurus had feathers (as I see in illustrations) than chances the coelophysoids had feathers would be great (considering they were so small and would need a lot of insulation [such as Gregory Paul's illustrations of the South African Coelophysis, or "Megapnosaurus", sorry as you see I'm a "lumper"]), possibly even gliders like the microraptorines. So the probability of feathers being very early on the family tree wouldn't be surprising. In fact, they may have evolved on the Lepidosauromorpha-Archosauromorpha split in evolution. Did I say coelophysoids could glide? My mistake: actually they probably had hair-like protofeathers used for the sole purpose of thermoregulation.